It was announced today by His Excellency, Major General Philip Michael Jeffery, AC CVO MC, Governor-General of the Commonwealth of Australia, that Steve Johnston, the Chairman of the Australian National 4WD Radio Network Inc. & Board Member of Tread Lightly! Australia has been awarded with the Medal of the Order of Australia (OAM) (General Division) in the 2004 Australia Day Honours List. The citation for the award is "For service to the community, particularly residents and travellers in remote locations, through the Australian National 4WD Radio Network". 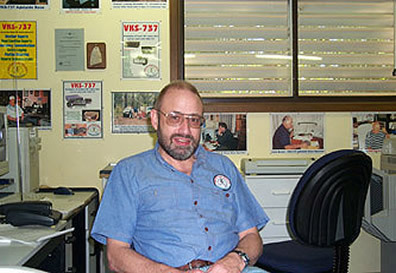 Steve at VKS-737 Head Office, Elizabeth, South Australia. Steve has had a long term involvement with both radio communications and outback communities and travellers; he spent 27 years in communications with the Department of Civil Aviation / Civil Aviation Authority leaving in 1992 to continue working in his own electronics business. Steve has been a member of the Toyota Landcruiser Club of Australia (SA Branch) since 1986 and spent many years as both a Committee Member and a Delegate to the South Australian Association of Four Wheel Drive Clubs, he is currently a Life Member of the Toyota Landcruiser Club. As a Delegate to the SAAFWDC he was the Association's Radio Officer as well as a Delegate to the Australian National Four Wheel Drive Council where he was also the National Radio Officer. Chairman and Administration Manager of the Australian National 4WD Radio Network Inc. awarded Medal of the Order of Australia. In 1992 Steve was involved in discussions leading to the establishment of the Australian National 4WD Radio Network, initially at South Australian level, expanding it into a national network in 1994, and eventually converting it into a Public Benevolent Institution (Charity) in 1996. Steve has been the Chairman of the Network since its inception in 1993 and, with the rapid expansion of the Network, has recently been employed full-time in the newly created position of Administration Manager. In 1996 an affiliation was formed between the Australian National 4WD Radio Network and Tread Lightly! Australia at which time Steve was voted onto the Board of Directors of Tread Lightly! Australia, a position he still holds. Steve is very active in promoting safe sensible outback travel incorporating the aims and objectives of the worldwide Tread Lightly! movement, both with existing and new members of the Australian National 4WD Radio Network, during his many appearances as guest speaker at service clubs, 4WD clubs and other similar organisations. Being taken for long walks by his dog Gypsy (a Silky Terrier who expects at least a 4km walk every day). Enjoying movies (both modern & vintage) & concert films in his custom built private cinema. Pictured: Steve receiving the Medal of the Order of Australia (OAM) from Marjorie Jackson-Nelson AC, CVO, MBE. Governor of South Australia.